Failure due to faulty wiring - including, but not limited to - poor connections, moisture intrusion due to improper connector sealing, shorts due to improper wire routing or protection, and/or improper wire gauge. A faulty starter relay allowing the starter to stay engaged or a starter that was intentionally over engaged due to a no-start condition. Improper/negligent installation causing damage to threads, mounts, and/or connectors. If LMR.com determines that the starter was improperly installed or modified in any way from its original design. Vehicle collision or collateral damage form other failed components. 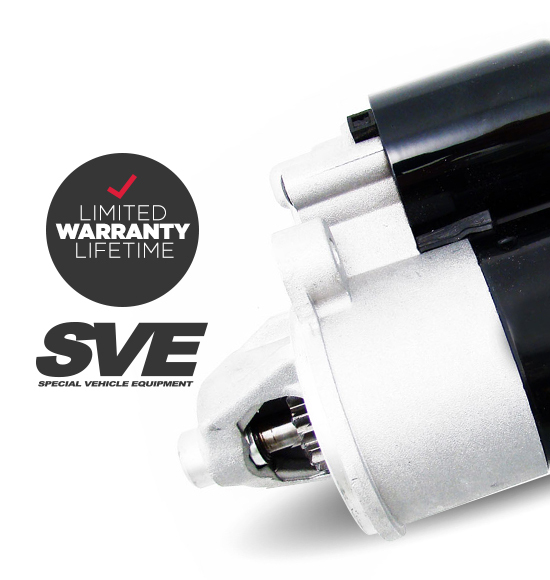 This warranty applies only to SVE Starters which have been installed in accordance with accepted industry standards by a mechanically competent individual or a recognized service dealer and certified technician. Cost of removal, installation, and incidental or consequential damage are expressly excluded. A warranty claim must be initiated with LMR.com prior to any SVE Radiator return or replacement. For more information on this Limited Warranty or to initiate a warranty claim, dial 254-296-6500 or email productsupport@lmr.com.